The world debut of its ultra-long-range Global 7000 is grabbing most of the headlines, but Canada’s Bombardier Aerospace (Booth N600; SD20) is also highlighting at NBAA 2017 several new developments: its new “Smart” programs for maintenance and training support; the Pro Line Fusion touchscreen cockpit upgrade for the Nextant Challenger 604 remanufacturing program; and the inauguration of its expanded maintenance and interiors facility in Tucson, largest of Bombardier’s global network of service centers. The Smart Services maintenance offering significantly expands coverage previously provided under Bombardier's pioneering cost-per-flight-hour Smart Parts program, and is immediately available for operators of new and—in a first—in-service Bombardiers less than 20 years old. Developed in response to customer feedback, Smart Service offers flat rate enrollment and an a la carte menu approach enabling operators to tailor coverage to their specific needs, said Jean-Christophe Gallagher, v-p and general manager, customer experience. Building on the Smart Parts foundation, Smart Service plans can include labor as well as parts, and unscheduled and well as scheduled maintenance events. Landing gear overhauls and cabin management and other electronic systems can also be covered. In developing the program, the company reviewed 1,500 recent consecutive maintenance transactions with Smart Parts customers worldwide. By comparing transactions with residual value data, Bombardier determined “those [aircraft] on an OEM per-hour program retain their value more than those that are not,” Gallagher said. Moreover, covered aircraft spend less time on the market when they’re sold. The Canadian airframer is also touting the inauguration of the newly expanded interior facility at its Tucson Service Centre at Tucson International Airport in Arizona. 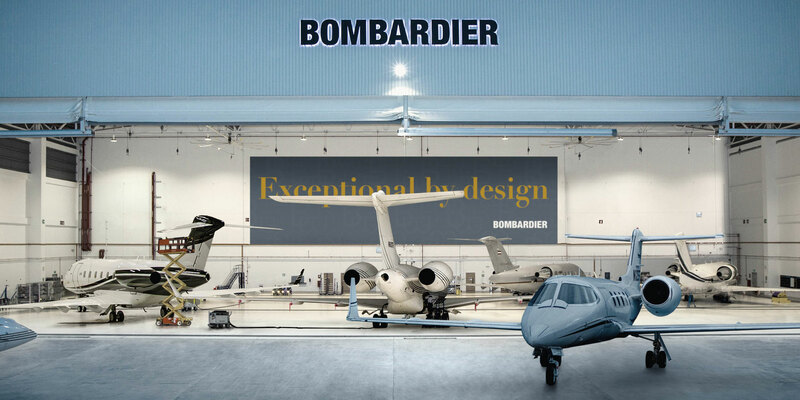 The largest in the Bombardier service network with 999,967 sq ft of covered space, the facility is “dedicated to setting new standards in customer care,” Gallagher said. Capable of handling 35 to 45 aircraft at one time, the facility includes a new purpose-designed interior atelier, gathering all interior design expertise and talent in one location. Within the atelier, the cabinet workshop space has more than quadrupled, to almost 5,000 sq ft, complementing the seat and divan upholstery fabrication area. The center can handle “the same kind of interiors work as in our completion center in Montreal,” Gallagher said, including installation of hardware and stone floors, cabinetry and complete refurbishments. Bombardier, in conjunction with Rockwell Collins, is also showcasing the Pro Line Fusion integrated avionics upgrade for the Challenger 604, introduced at EBACE this year. Bombardier representatives are on hand at the Challenger 604 on static display to explain the all-in-one solution and how it complies with pending equipage mandates while modernizing the flight experience for pilots. The upgrade brings large-format display technology with touchscreen interface, synthetic vision and graphical flight planning to the Challenger’s cockpit. Certification of the upgrade, available through Bombardier and Nextant Aerospace, is expected by fall 2018. Additionally, Bombardier is putting the spotlight on its new Premier cabin interiors, showcased in the Global 6000 at the company’s static display. Introduced at EBACE this year for Global 5000s and 6000s, the Premier interior incorporates cabin elements from the Global 7000, including new seat design with hand-stitched leather and intelligent ergonomic features such as higher armrests and sculpted backrest. The streamlined galley, wood and stone flooring options, Ka-band high-speed satcom and the Venue advanced cabin management system have also been brought aboard from the 7000’s planned cabin appointments. Two-tone veneers and sleek side ledges epitomize the modern aesthetics, accentuating the spaciousness of what is already the widest cabin in class.